Charlotte Suggett, 26, is a freelance stylist who lives in London. 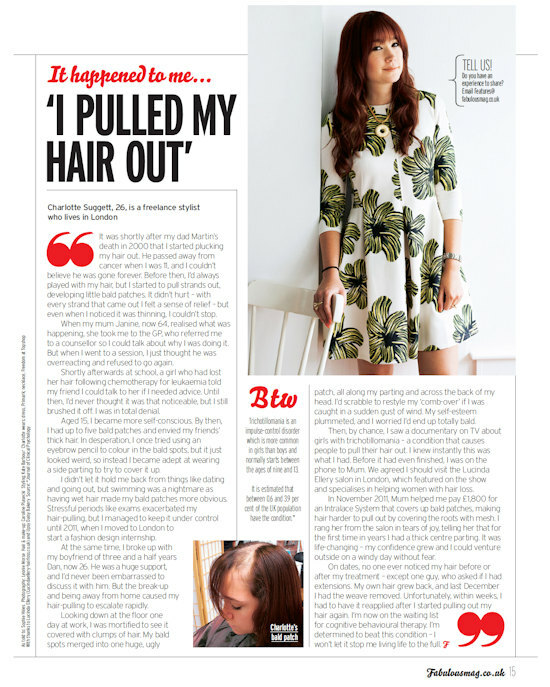 Here she talks to Fabulous magazine about how the death of her father led to her pulling out her hair. It was shortly after my dad Martin’s death in 2000 that I started plucking my hair out. He passed away from cancer when I was 11, and I couldn’t believe he was gone forever. Before then, I’d always played with my hair, but I started to pull strands out, developing little bald patches. It didn’t hurt – with every strand that came out I felt a sense of relief – but even when I noticed it was thinning, I couldn’t stop. When my mum Janine, now 64, realised what was happening, she took me to the GP, who referred me to a counsellor so I could talk about why I was doing it. But when I went to a session, I just thought he was overreacting and refused to go again. Shortly afterwards at school, a girl who had lost her hair following chemotherapy for leukaemia told my friend I could talk to her if I needed advice. Until then, I’d never thought it was that noticeable, but I still brushed it off. I was in total denial. I didn’t let it hold me back from things like dating and going out, but swimming was a nightmare as having wet hair made my bald patches more obvious. Stressful periods like exams exacerbated my hair-pulling, but I managed to keep it under control until 2011, when I moved to London to start a fashion design internship. At the same time, I broke up with my boyfriend of three and a half years Dan, now 26. He was a huge support, and I’d never been embarrassed to discuss it with him. But the break-up and being away from home caused my hair-pulling to escalate rapidly. Looking down at the floor one day at work, I was mortified to see it covered with clumps of hair. My bald spots merged into one huge, ugly patch, all along my parting and across the back of my head. I’d scrabble to restyle my ‘‘comb-over’ if I was caught in a sudden gust of wind. My self-esteem plummeted, and I worried I’d end up totally bald. Then, by chance, I saw a documentary on TV about girls with trichotillomania – a condition that causes people to pull their hair out. I knew instantly this was what I had. Before it had even finished, I was on the phone to Mum. We agreed I should visit the Lucinda Ellery salon in London, which featured on the show and specialises in helping women with hair loss. In November 2011, Mum helped me pay £1,800 for an Intralace System that covers up bald patches, making hair harder to pull out by covering the roots with mesh. I rang her from the salon in tears of joy, telling her that for the first time in years I had a thick centre parting. It was life-changing – my confidence grew and I could venture outside on a windy day without fear. On dates, no one ever noticed my hair before or after my treatment – except one guy, who asked if I had extensions. My own hair grew back, and last December I had the weave removed. Unfortunately, within weeks, I had to have it reapplied after I started pulling out my hair again. I’m now on the waiting list for cognitive behavioural therapy. I’m determined to beat this condition – I won’t let it stop me living life to the full.